The Oconee Community Mentoring Association (OCMA) Dream Team Club’s celebrated the 25th Anniversary bike ride of the BRAG Dream Team in Dublin on March 23. The “Godfather” of the BRAG Dream Team, Coach Atiba, was recognized for fulfilling his dream – to grow the BRAG Dream Team beyond its 1994 birth as an Atlanta Public Schools program for middle school students and create a statewide organization that provides extraordinary cycling and camping experiences for underserved middle and high school age youth. Coach Atiba was recognized for his 24 years with OCMA. In 2011, Dublin became the first city to build a BRAG Dream Team Club, thanks to Christopher Johnson, OCMA’s Founder, and veteran educator and BRAG Dream Team Coach Phyllis Turner. OCMA’s success in Dublin spawned Dream Team clubs in Madison, Milledgeville, and Brunswick. BRAG Dream Team recently expeanded, with Macon joining the network in 2019. Over the last eight years, a magnificent transformation of youth in Dublin has taken place through OCMA activities. Lifetime collaborative relationships have formed with youth and adults in cities across Georgia. 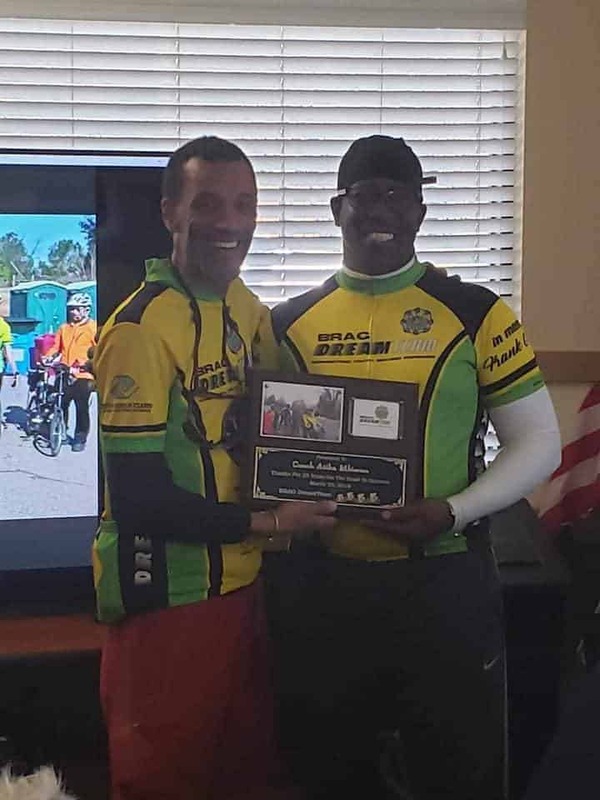 Coach Chris of the OCMA BRAG Dream Team presented the plaque to Coach Atiba in appreciation of his 24 years of youth development and cycling advocacy.